Some of the finest handmade cigars in the world are made in Central America. 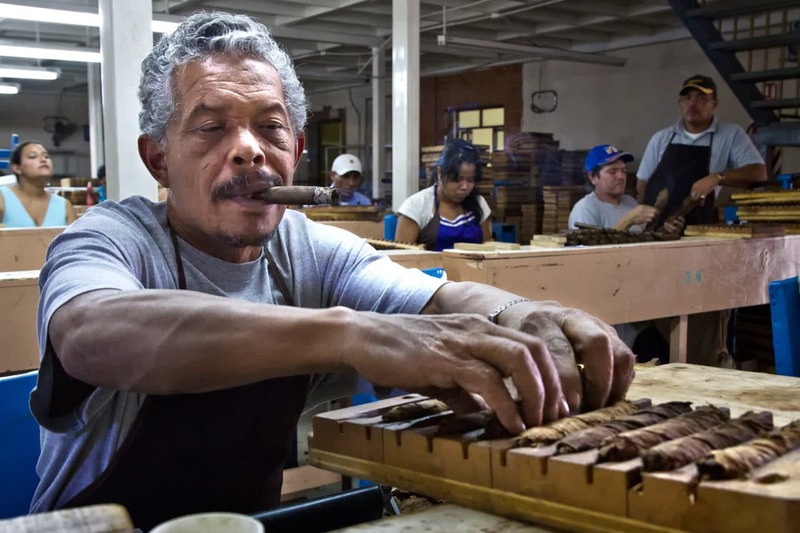 Many cigar makers fled Cuba during the revolution and re-started their businesses here. The little town of Esteli Nicaragua is now home to many of them. The intense smell in there will make your eyes bleed. While I’m no Cigar Afficianado, I do enjoy a relaxing smoke once in a while. Lazily rolling the tasty tobacco vapor around in my pallet, then slowly blowing it back out again is quite an enjoyable experience. So I decided to visit the Tabacalera Santiago cigar factory, owned by Francisco Santiago F. Perez (a Cuban), to watch the whole process from start to finish. After I ignorantly pay a taxi to drive me just 4 blocks down the road :??? : we arrive at the factory gates. Turns out you get a free tour guide to show you around, provided you buy a few cigars at the end. Sounds good to me! First we visit the room where they make the cedar boxes that store the final products. It’s just 3 or 4 guys standing around a single band-saw. Not too impressive. Next, it’s time to check out the fermentation shed. This is where the Nicaraguan tobacco leaves (grown with Cuban seeds) are stored in a heat & humidity controlled room for about a year, undergoing chemical changes. This is how the aroma and taste of the leaf develops. The fermentation room is not for pussies. The intense smell in there will make your eyes bleed. It’s not an enticing, fine-cigar type aroma, but more like a “I just dumped a bottle of ammonia on your face” kinda thing. Spending 15 minutes in the shed was tough enough, I have no idea how local workers spend every day in there! Once the tobacco has fermented for 1 year, it is washed & left to dry on racks. After the drying process, the leaves are ready to be sorted again. Some leaves will be used as wrappers, some as binders, others as filler. Filler is stuff in the middle of the cigar, binders hold the filler together, and the wrapper is the fancy outer layer. When we entered the next building, I was surprised to find it full of strippers! 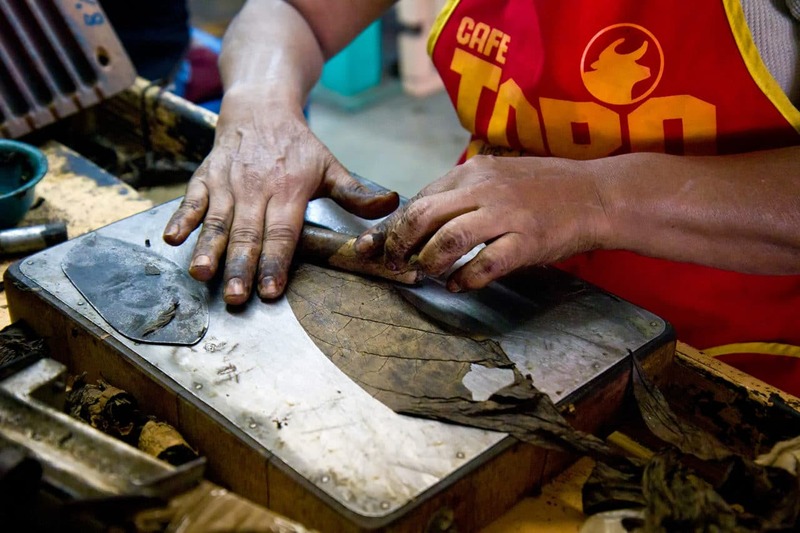 A team of women was hard at work, stripping out the main-vein from the tobacco leaves. This is done so the filler tobacco will burn continuously inside the cigar. 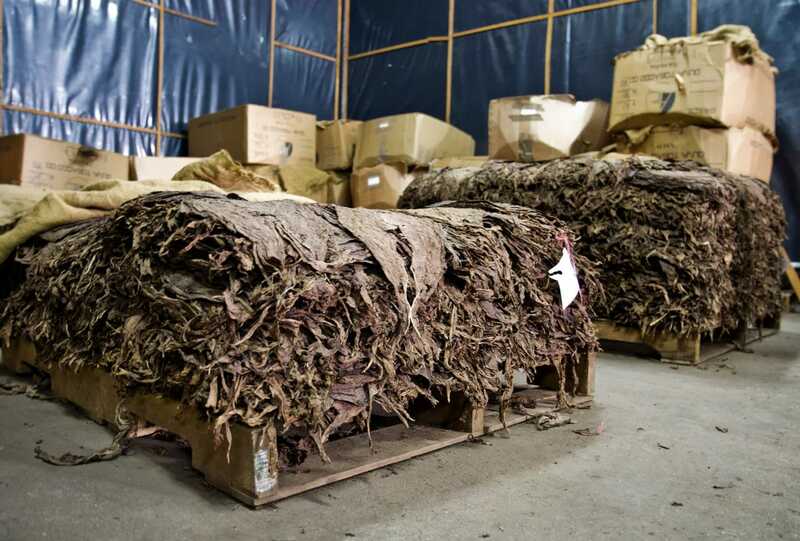 The stripped & sorted tobacco leaves then make their way to the professional rollers. These men and women are real artists, it takes at least a year of training to become proficient. Each roller has their own work table with a metal rolling surface, crescent-shaped knife called a chaveta, and a container of vegetable-based glue. They start by gathering filler leaves and rolling them up in a loose cigar shape, with a binder leaf holding the bundle together. This is then placed in a wooden mold, which will get pressed to help form the proper cigar shape & density. The cigars are now ready to be wrapped with, you guessed it, the wrapper! After cutting away any loose tobacco with the chaveta, the roller carefully lays out the fancy, darker colored tobacco leaves, and cuts them to size. 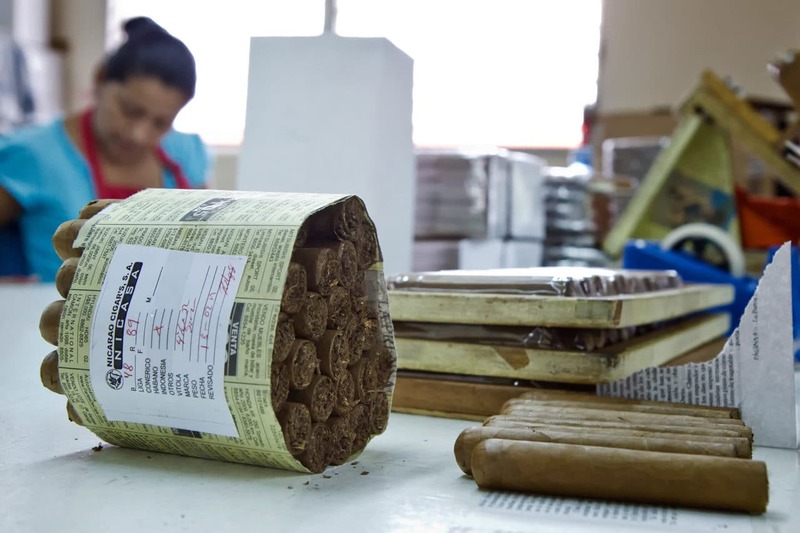 A little vegetable paste is applied, then as fast as you can blink, the skilled worker rolls the wrapper around the cigar. Finally, a small piece of wrapper-leaf is cut into a little circle, then glued to the tip to finish the package. With the cigar completed, it’s off to get labeled and packaged. 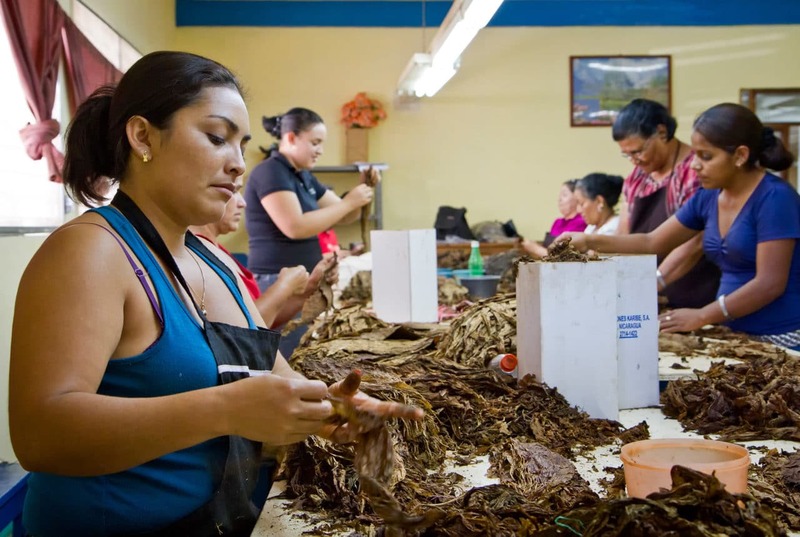 Another group of women are responsible for quality control, making sure the cigars are matched up according to color and size. This factory makes cigars for many different brands, from all over the world. So they label & package them according to who the client is that day, box em’ up, and ship em’ off. The factory can produce over 30,000 cigars a day! The Tabacalera Santiago Factory’s most promenant customer is Rocky Patel. But I ended up buying a different brand for myself, called Nica Libre, which is also produced at the factory. This was on the recommendation of my tour guide. Quite a bargain at $1 a cigar! (Nica Libre cigars cost $7 each in the States). Later that night I had a nice peaceful smoke on a bench in the central park of Esteli, watching local kids breakdancing and families out walking about. I enjoy the Nica Libre blend around the office as an everyday go-to cigar since its rich, smooth, flavorful, well constructed and maintains an enjoyable aroma. You’ll experience toasty nuances of earth and cedar with sweet notes in the finish and some natural flavors of espresso and coffee. The finish is hearty and memorable while the draw is effortless.